Many of the items I feature on this blog are now available in my shop, The Reclaimed Life. 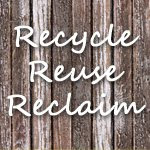 The Reclaimed Life was started by myself and dear friend Brenda Babcock, who also loves to create and re-create useful home decor items from salvaged pieces. We love custom orders!